Indonesian civil society groups are expressing concern President Joko Widodoâs choice of an influential Islamic cleric as his vice-presidential running mate, seen by many observers as a smart political move, could lead to the further erosion of minority rights amid rising religious conservatism in the worldâs largest Muslim-majority nation. Last week, the president, widely known by his nickname Jokowi, confirmed the selection of Maâruf Amin, the supreme leader of Indonesiaâs largest Muslim organization Nahdlatul Ulama (NU) and the chairman of the conservative quasi-governmental Indonesia Ulema Council (MUI), the latter of which is responsible for Halal certification in the archipelago. Despite some political experience in serving on the Presidential Advisory Council under Jokowiâs predecessor Susilo Bambang Yudhoyono, during which time he was instrumental in the in troduction of controversial so-called âreligious harmony lawsâ, the 75-year-old Maâruf is a somewhat unconventional choice. The incumbentâs major opponent, meanwhile, will be former military general Prabowo Subianto, who also ran against Jokowi in the 2014 presidential race. He will be joined by wealthy businessman and Jakartaâs current vice governor, Sandiaga Uno. In a bitterly fought 2014 campaign, Prabowoâs side frequently sought to depict Jokowi as inadequately sympathetic to Islamic interests. While Jokowiâs popularity remains high â" a survey from Saiful Mujani Research and Consulting in December 2017 putting his approval rating at 76 percent â" his Islamic credentials have rema ined a point on which he is attacked by opponents. 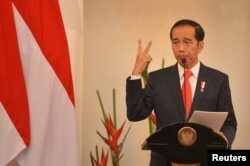 Indonesian President Joko Widodo delivers a speech at Foreign Ministry office in Jakarta, Indonesia, Feb. 12, 2018. Maâruf last year played a key role in toppling Jokowiâs former ally Basuki âAhokâ Tjahaja Purnama, t he ethnically Chinese Christian former governor of Jakarta who became the target of a campaign by hardline groups to oust him from office after he was accused of insulting the Quran. He also served as an âexpert witnessâ for the successful blasphemy prosecution against Ahok, for which the once-widely popular politician is now serving a two-year prison sentence. According to Professor Edward Aspinall from the Australian National University, âJokowi saw this massive Islamist mobilization against that Christian Chinese governor as a sign of how his own political career could come to an end, and since that time heâs been trying to shore up his position politically on the Islamic right and in particular by appealing to leaders of Nahdlatul Ulamaâ and the MUI. Maâruf has been a âlynchpinâ of this strategy, Aspinall told VOA. An ally of Jokowi told local media this week that Ahok was âa thousand percentâ not angry about the presidentâs choice of deputy. Human Rights Watchâs Indonesia researcher, Andreas Harsono, said Maârufâs role in âsinglehandedlyâ drafting the religious harmony law in 2006, which âreplaced the principle of religious freedom where citizens have equal rightsâ and made it significantly more difficult for minorities to build places of worship, means that his candidacy does not bode well for the rights of non-Muslim Indonesians, women or the lesbian, gay, bisexual and transgender (LGBT) community. 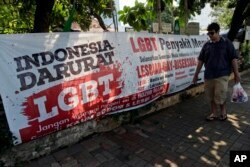 A man walks past an anti-LGBT banner with writings that read "Indonesia is on LGBT emergency" and "LGBT is a contagious disease, save the young generation from LGBT people." On the opposition side, Prabowo will mobilize a ânationalist, populist authoritarian appeal to strong leadership,â said Aspinall. His running mate Uno, who was also instrumental in the campaign to topple Ahok, was chosen after he pledged IDR500 billion ($342,700) to both the Islamic PAN and PKS parties. Sandi, as Uno is known, hails from Gorontalo on the island of Sulawesi and will be the only candidate on the presidential ballot who is not from Java. In a diverse country of thousands of islands and hundreds of languages, which has nevertheless been long dominated by the ethnic Javanese majority, this could prove an important factor in attracting the votes of ethnic minorities â" particularly those in Sulawesi.